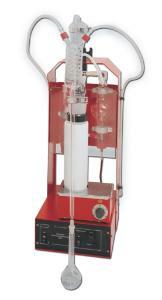 Distillation apparatus for determining the alcohol content and the volatile acids in wine and other alcoholic drinks. The supplied Windows software allows a bidirectional transmission of application-specific distillation parameters using the RS232 interface between one or more devices and a PC. A library with current applications is already included on the CD. The RS232 interface also allows data to be transmitted from the device to the PC during operation. The user can save the data and print it as required. 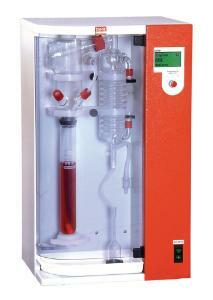 Toimitustiedot: Complete glassware set with volumetric flask and pycnometer.